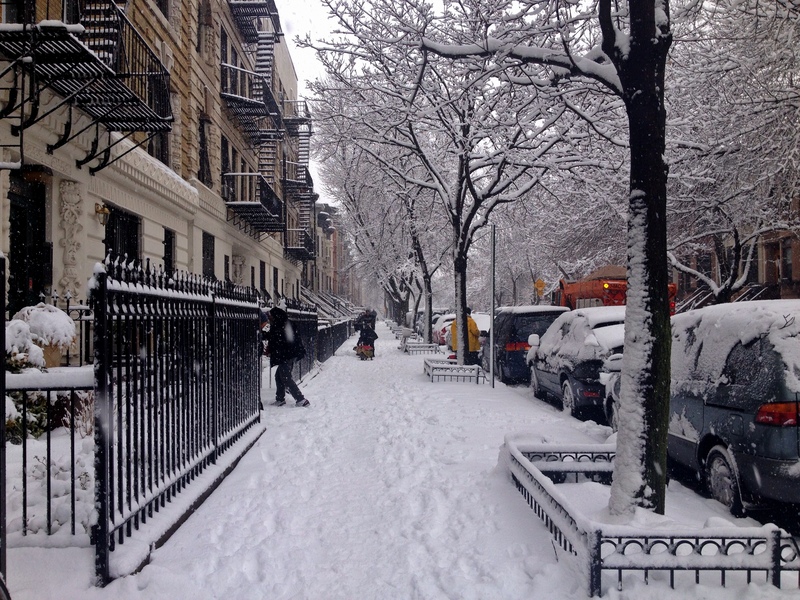 I’ve lost track of how much snow has fallen on New York City this winter. This morning’s commute was a sloppy one–and we’re supposed to be getting two more rounds before the week is through. My office has been a comedy of errors since the new year. Today an air conditioning hose burst while workers sanded the outer wall, creating a dusty haze that found me grabbing for my inhaler and sending everyone home early. And so, three hours after arriving at the office, I was slogging back through the slush. I took a different route than usual so that I could swing by Whole Foods to pick up a large can of olive oil. Dreading the wet subway ride home, I roamed the aisles for a bit. The guy behind the fish counter was fervently pushing the wild Alaskan sockeye, which was on sale. My craving was so instantaneous and intense that I have to believe I’m suffering from some sort of deficiency. I haven’t been eating much fish as of late, in part because last semester’s foray into the world of collapsing fisheries left me a bit freaked. But a quick check of Seafood Watch confirmed that wild sockeye is one of the better choices. I arrived home an hour later, popped the fish into the fridge, changed into pajamas, and spent the afternoon emailing and editing while the snow continued to fall. By 6:00 I was ready for dinner. I had lots of root vegetables from my CSA share and some collard greens that were already looking a little sad when I bought them a week and half ago. Some of the larger outer leaves seemed salvageable. Wild salmon is much leaner than farmed, containing about half the fat but roughly the same amount of protein. I’ve found that it dries out quickly as a result, so I hatched the notion of wrapping the fish in collards to hold the moisture in during cooking. Rinse the collards and steam in a lidded pan for 5 minutes or so, adding more water as needed to prevent scorching. You want the leaves to be pliable and dark green. Remove from the pan and spread out to dry. Rinse out the pan, add 2 tablespoons of coconut oil and bring up to medium-low heat. Add the red onion and sauté until it starts to brown around the edges. Add the parsnips and daikon radishes along with 1/4 cup water and pop the lid back on. When the vegetables have started to soften, remove the lid and cook off the water, allowing things to caramelize. Sprinkle with zest, salt and pepper. (I find that white pepper really complements the sweetness of parsnips, but it’s all good.) Remove to a plate or, if your pan is big enough, just slide them to the side. Rinse and dry your salmon, sprinkling both sides with salt and pepper (black in this case). 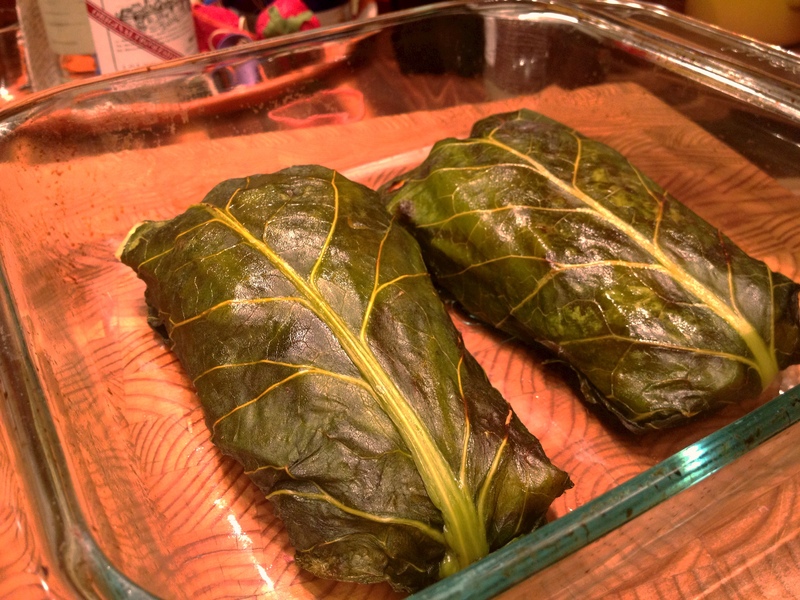 If your collard leaves are small, slice each filet in half lengthwise. Add 1 tablespoon of coconut oil to the pan, still over medium-low heat, and cook the salmon for two minutes per side, starting with the skin down if you’ve got it. Spread the collard greens on your work surface and spoon half of the vegetable mixture into the center. Top with the salmon, skin side up. 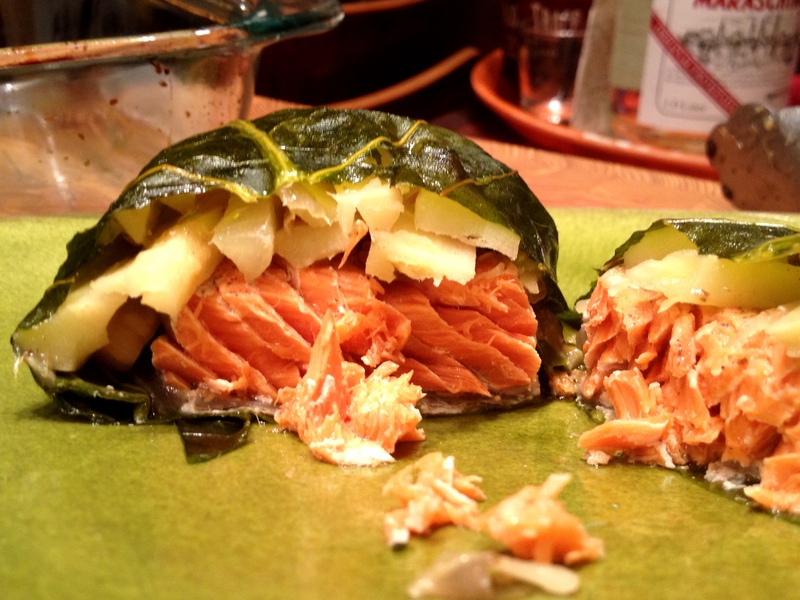 Fold the sides, top and bottom of the collards over the salmon as you would a burrito. Flip and place gently into a baking dish lightly greased with coconut oil. Bake in a 350-degree oven for 10 minutes and serve immediately. This recipe makes enough for two hungry people, so scale up or down accordingly. You could easily swap in different vegetables–leeks, fennel, potatoes, carrots, etc.–based on what you have on hand. This entry was posted in main courses, seafood and tagged collard greens, parsnips, radishes, salmon by Jasmine Nielsen. Bookmark the permalink.